Joint Base Andrews is a military facility located in Prince George's County, Maryland. The facility is under the jurisdiction of the United States Air Force 11th Wing. The base is named for Lieutenant General Frank M. Andrews (1884–1943), former Commanding General of US Forces in the European Theater of Operations during World War II. Andrews is widely known for serving as the home base of operations for Air Force One. 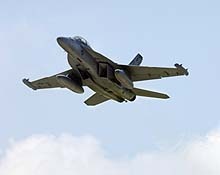 The facility combines Andrews Air Force Base and the Naval Air Facility Washington which were merged on 1 October 2009.